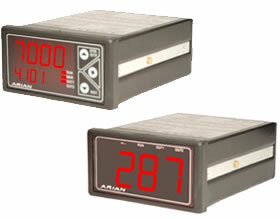 - Alarms with 2 output relays. - Set up from PC. - 4..20mA and 0..10V output. - Maximum / minimum reading. Simple panel meter with 3 1/2 extra large and bright digits (25 mm , 1") . Several input types in same instrument. ID15, voltage and current inputs. ID15T, thermocouple, pt100 and 4-20ma. Configurable multipurpose counter, substitute a large variety of counter and timers (up/down count, quadrature count, timer, etc). 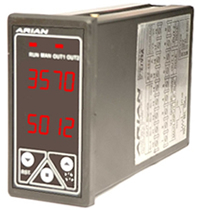 In simple applications may substitute a PLC's having the advantage of dual four digit displays and a keyboard for parameter setting.